We take pride in our bear hunt and are confident that we can exceed your expectations on the quality of your experience with us. 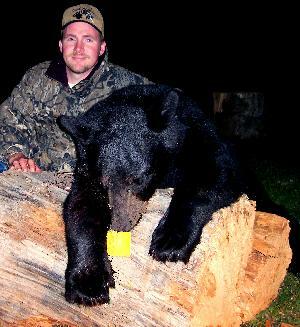 Successful bear hunts have been conducted at Poplar Ridge Lodge for the past 10 years in a secluded area of 150 square miles. Our region has an abundant population of mature black bears, due in part to an adjoining bear sanctuary of approximately 200 square miles. We have a healthy, stable bear popluation which is maintained by limiting the hunt to 20 hunters per year. 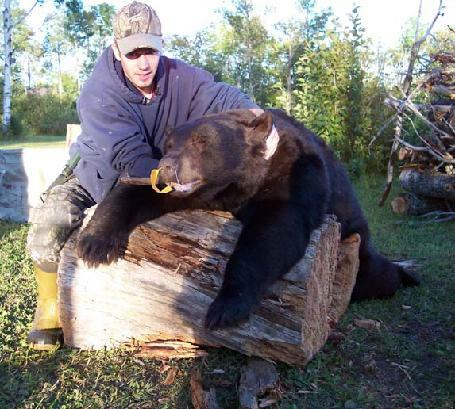 The largest bear taken at Poplar Ridge was over 500 pounds, taken by shotgun in 2004. Since Darrel took ownership in 2003, we have had several Pope and Young entries. We see many white crests and Vs and some cinnamon phase bears. All stands are suitable for firearm and archers. 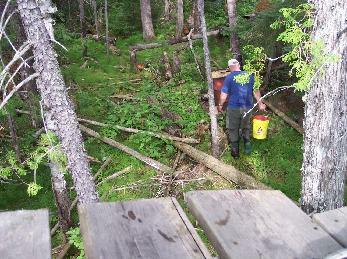 We conduct our hunts in tree stands over active bait sites. Two people can comfortably fit in most stands. Stands are secluded and most are accessible only by water, so when you are ready to hunt we will deliver you to your stand and later, pick you up. Sites are baited at least three weeks prior to your hunt, so we are aware which stands are active. Many of our hunters see multiple bear while waiting for their trophy. 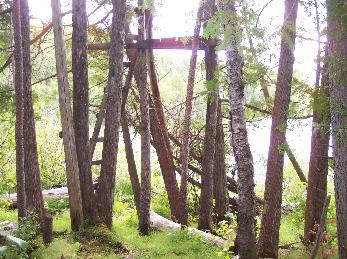 Stands are baited so that hunters have a choice of active stands. After you have harvested your trophy bear, you can spend the rest of the week fishing for walleye and northern pike and jumbo perch. 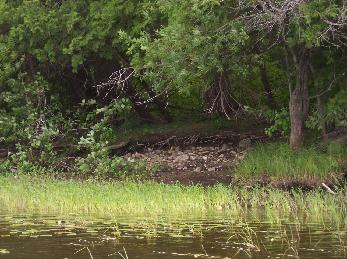 Boat, gas and bait are provided as part of your hunt.